A slip and fall accident occurs when an individual loses traction or balance, trips over an item, debris or an unexpected object and falls. Most personal injury slip, trip and fall victims fall backward resulting in serious injuries that range from concussion to paralysis and from spinal injuries to broken/fractured bones. Hip fractures are the most dangerous particularly for elderly victims. Owners and/or managers of properties and public areas are responsible to provide a safe environment for anyone using their property. 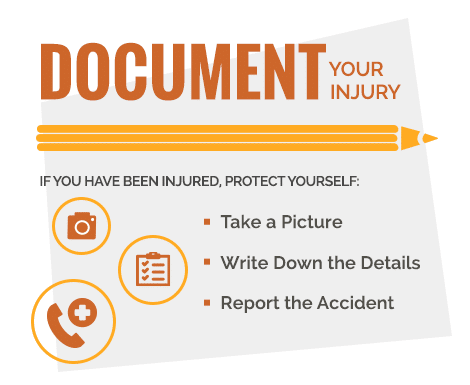 If you or a loved was injured in a slip, trip and fall, you may be able to receive compensation for your injuries by filing a personal injury claim. A Philadelphia personal injury lawyer will know how to handle your case. A slip and fall or slip, trip and fall accident can happen at anytime, anywhere. It is not the fault of the injured victim that the accident occurred. Often the property owner/manager is liable for the accident and resulting injuries. If you were injured in a slip, trip and fall you may be eligible for compensation by filing a personal injury lawsuit. The Centers for Disease Control and Prevention (CDC) reveals that accidental falls are also responsible for 30,000 deaths annually. Personal injury accidents, such as slip, trips and falls, and slips and falls are common. In most instances, the victim of a slip and fall incident becomes injured due to dangerous property conditions such as an icy parking lot, a slippery floor in a store or at an airport, a slippery entrance, or an improperly secured railing at a construction site. Slip and fall accidents can happen at any time, anywhere. 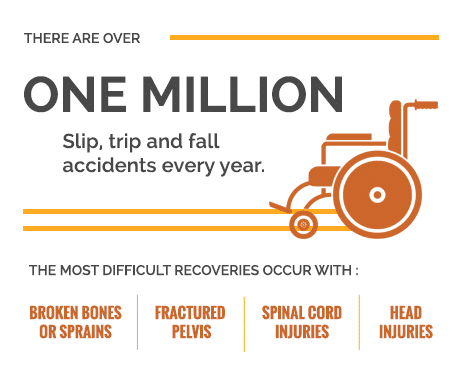 Personal injury statistics from the National Hospital Ambulatory Medical Care (NHAMC) survey indicate slip and fall accidents are the leading cause of unintentional injuries in the United States resulting in over 11 million ER visits. Virtually 1 million of those visiting an emergency room were the result of slip, trip and fall incidents and 300,000 of those incidents were temporarily disabling. Slip, trip and fall injuries makeup at least 15 percent of all job-related injuries and result in an annual cost to businesses of 11 billion in workers’ compensation. How do slip and fall accidents happen? Slip and fall incidents almost always happen on level ground, but there are instances where a victim may trip over something prior to falling, such as an uneven sidewalk. Slips and fall are, also, frequent on stairs with unsecured railing, poor lighting or no handrails. Wet floors often cause slip and fall accidents. Wet floors and spills can be found in just about any building, from the grocery store to the dentist and from the dry cleaners to the airport or bus station. Whether the floors have been mopped with water or freshly waxed, those areas need to be clearly indicated by adequate warning signs. It is also the responsibility of the workers of those establishments to clean up any debris or spills. Slipping and falling while at work can also be dangerous whether you work in an office building, a construction site, a retail store, an airport or a warehouse. Slippery floors can be found in all those locations, along with broken flooring, defective equipment, unsafe railings on stairs and unsecured, exposed cables. The property owner, whether of a residential or a public property, has a duty to clear any ice, snow, debris, spills as soon as possible or face the possibility of being held liable for a fall. A property owner has the responsibility to adequately mark any broken, cracked or crumbling flooring or pavement. It is also an owner’s responsibility to quickly repair any damaged or missing surface or equipment. You have the right to be safe while you walk in a public or workplace setting. An experienced slip and fall attorney can secure compensation for medical costs and pain and suffering. If the slip and fall resulted in a death, your attorney can win compensation for the loss of a loved one. Over 1 million Americans slip, trip and fall each year, whether they are at home or out in a public place. Slip and fall accidents are caused by conditions that could have been avoided and should have been corrected. Out of the one million falls, some result in death. More than 17,000 die each year as a result of slip and fall accidents. Fractures and brain injuries can result from falls. The most common fractures suffered in falls are hand, forearm/upper arm, hip, pelvis, and spine. Falls also cause 40 percent of traumatic brain injuries in the nation-requiring emergency medical care, hospitalization or death. Traumatic brain injuries resulting from a fall most often affect the youngest and oldest. Over 95 percent of broken hips are sustained in falls. One in five hip fracture victims die within 12 months of their injury. Falls result in more than 25 percent of spinal cord injuries overall. Most spinal cord injuries happen in adults age 65 and older. 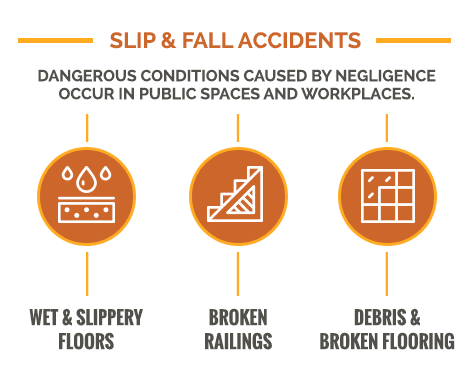 Where do Slip and Fall Accidents Occur? Entrances and stairways are the scene of many slip and trip accidents. Uneven bricks and buckled pavement are also culprits. Studies show the most likely place to slip and fall is at a grocery store. Worn/torn carpeting/uneven surfaces are often the culprit in retail stores for trip and fall accidents. Apartment entrances/stairways are the scene of many slip and trip accidents, as well. Parking lots with uneven asphalt, buckled pavement and snow/ice are another common area for slip and falls. Many falls happen in nursing homes. In fact, one in three older Americans falls each year. The average cost to an individual who slips and falls is nearly $23,000. The food service industry pays out approximately $2 billion every year to settle slip and fall claims. Slip, trip and falls result in a wide variety of injuries. Hiring an experienced personal injury attorney is the first step to obtaining fair and equitable compensation for any injuries you may have sustained in a personal injury accident, such as a slip and fall. The attorneys at MyPhillyLawyer are here to help you win your lawsuit. They provide consistent high-quality legal representation and keep you informed, going the extra mile to get the compensation you need and deserve. Get Your Free Case Consultation Today! Contact our law firm today, we can help. It costs you nothing to learn about your legal rights, so why wait? Apple Store or Google Play. © 2019 MyPhillyLawyer of Silvers, Langsam & Weitzman, P.C. MyPhillyLawyer did a great job for me in my behalf after I was struck by a SUV at a crosswalk. They won my case and a sizeable award. Thankful and grateful for a good team who did a great job. I had a complicated case with the My Philly Lawyer Group. I found it to be a very easy and effortless transaction. My Attorney was Frank who communicated and informed of things as soon as possible by both email and phone. Dean also stepped in frequently for assurance and adding his personal touch, even personally responding to my calls on his birthday from home! One thing I can say is that he did sway from his original fee agreement. In an effort to settle the case, Dean personally agreed to take a lesser amount. I really appreciated that and will definitely contact this firm if needed in the future! I was a personal injury client in a trip-and-fall case. I received excellent representation, competent, fair and diligent in every way. They were very kind and easy to work with, I felt protected and well taken care of. I highly recommend this Firm. We were referred by a friend and we received excellent advice over our accident and were happy with the settlement and the turnaround time on it. Amy Mari, Supervising Litigation Paralegal, in particular kept us up to date with our case on a regular basis, which is one of the reasons we would return. The firm itself kept its word over a handshake regarding fees, which is admirable. I’d recommend them if you have to obtain a lawyer. I chose MyPhillyLawyer to represent me for the car accident I was in, and I am very happy with my decision. Dean Weitzman and his team have my best interest at hand, and Leslie and Simone are always there to answer any questions I may have and to help me understand the process. I highly recommend their firm!